Any twilight golf on new year day? But can see ball meh? I dun mind! My friends just played e 5am tee off last Saturday. They finished their game at 10am, beat the causeway jam. The only thing was the first few holes if your ball does not land on fairway, hard to find. How's the condition at Ponderosa now? Think I last played there more than 10 years ago... Fairway condition comparable to HH ? Greens too slow? 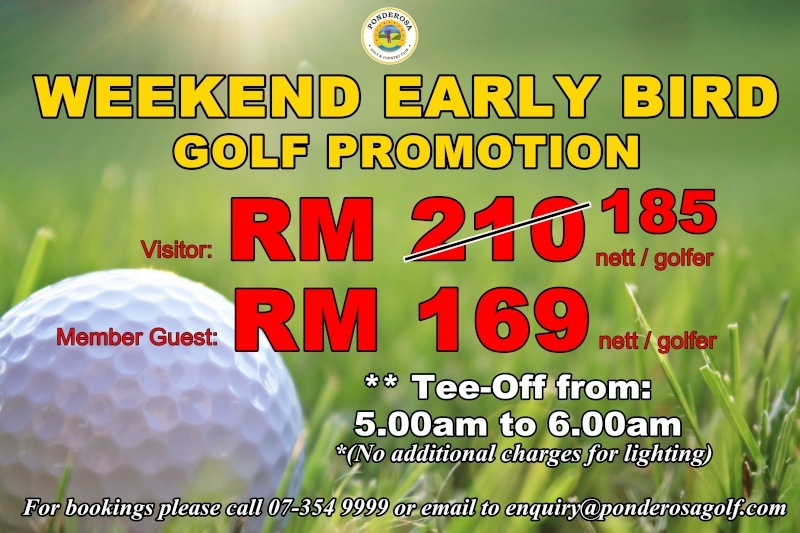 I think it's a great idea to tee off this early.. Great weather and less of traffic congestion..
Ponderosa was one of my earliest memories golfing in JB many years ago. Having not been there ever since my Kaki called and we decided to play at Ponderosa twice around November during weekdays. It turns out the course condition is pretty good with consistent greens around 9.0 speed and fairways in good condition. The rough is reasonable not too punishing. The clubhouse is good condition and toilets a plus. We had coffee breaks in morning and had decent fast food. Buggy on track means must get caddies to help drive the buggies n carry the clubs haha. ..
Will try this one weekend. ..